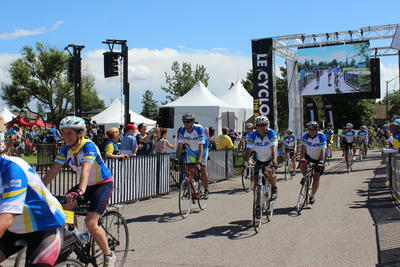 Team Velan will be participating for the fifth year in a row in the Ride to Conquer cancer. This major cycling event is benefiting the Segal Cancer Centre at the Jewish General Hospital. All the proceeds raised by Team Velan will go to support cancer research, treatment and services. The Jewish General Hospital is a comprehensive institution devoted to cancer research and care, and the work they are doing is leading-edge. It is a motivated team of Velan employees, along with their family and friends, who have taken up the challenge to ride 230 kilometers - from Montreal to Quebec City - in order to raise funds for this worthy cause. This year, the Ride takes place on July 7th and 8th, 2018. The total objective is $62, 500! We’re appealing to your sense of family and community to support the team in this endeavour. Your donation will go even further because Velan Inc. and the Velan Foundation will match your donation! For example, your donation of $25 will actually result in a total of $50 being donated to this important cause. You can make individual donations to the rider(s) of your choice or to the whole team by linking to the webpage shown below. Donations of $10 and over will receive a tax receipt. All donation amounts are greatly appreciated by Team Velan and by the many people who will ultimately benefit from the care it provides.